From time to time people ask me what resources I utilize in preparing sermons or series. This was something I encountered quite a bit with the series we just finished at Eastbrook, “Resurrection Hope,” on 1 Corinthians 15. So, let me pull aside the veil a little bit on how I approached five weeks on this brilliant chapter from Paul’s letter to the church in Corinth. I always begin series planning far in advance with in-depth study, meditation, and prayer over the text I am approaching. In this case, I spent time reading all of 1 Corinthians, giving particular attention to observe repetition of words, key themes, and flow of logic within chapter 15. I took some time to study parallel passages in Paul’s letters, such as 1 Thessalonians 4-5 and 2 Corinthians 4-5. For each week ahead of preaching, I studied the passage from the NIV with consultation to various other English translations (e.g., ESV, NRSV, NLT) and the Greek text via the free Logos Bible app, which has an amazing amount of study tools accessible for free. When I work through a book or chapter of the Bible for a series, I usually choose one biblical commentary as my main companion. 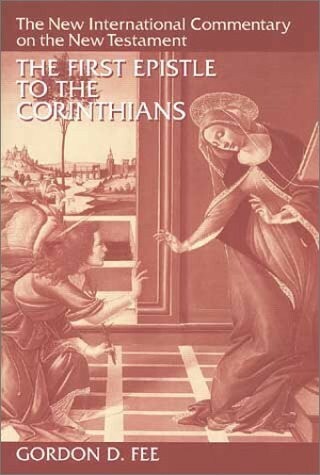 This time my companion was Gordon D. Fee with his very helpful volume on 1 Corinthians in the New International Commentary series (I just discovered there is a revision due out in September 2014). Fee is a solid textual and exegetical scholar, with a balanced approach to academic and practical insights.